Team USA worked through some major setbacks in this years World Long Distance Mountain Running Championships in Podbrdo, Slovenia. Following is the story of our journey to 4th place for women and 5th place for men among about 19 nations. The World Mountain Running Association (WMRA) held the 13th annual Long Distance Mountain Running Championships in Podbrdo, Slovenia on June 18, 2016, at the Gorski Marathon (GM40) in the Julian Alps. The course included about 9750 feet of gain (3000m) in 25 miles (40 km) with small portions of rocky and steep terrain and long sections of logging roads. 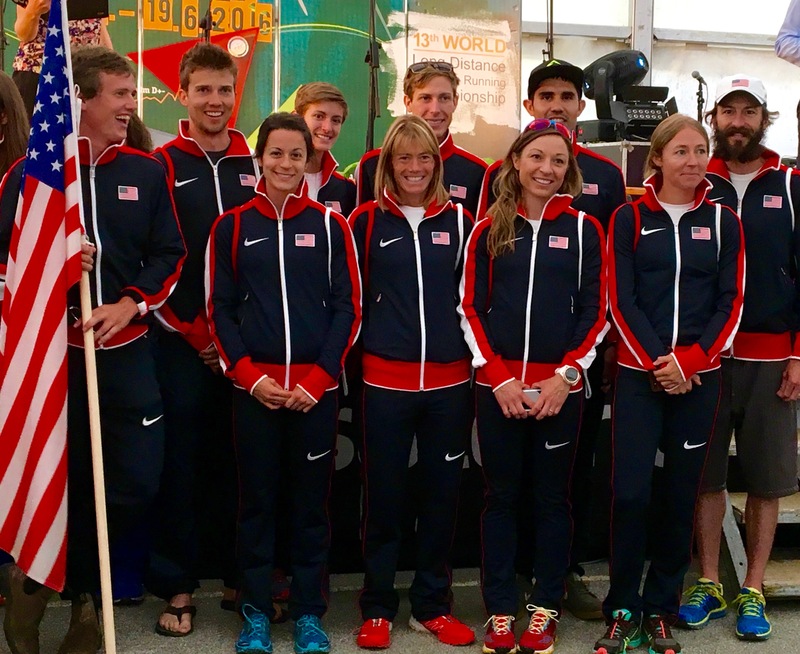 USA Track and Field announced the Long Distance Mountain Running Team (USMRT) on April 22, 2016 including: Andy Wacker, the US Trail 50 km Champion, Megan Kimmel and Mario Mendoza Jr., the 2015 US Trail Marathon champions, Maria Dalzot the US Trail Half Marathon Champion, Anita Ortiz with numerous USMRT titles to her name including Masters World Champion in 2004 as well as a win at Western States 100 Mile Endurance Run in 2009, and Peter Maksimow member of the 2015 silver medal-winning US team. Cameron Mayfield, the 2016 Eugene Marathon champion also joined the team. Each year, the WMRA selects and announces the site for following year’s world championship race. Each participating nation then choses their own qualifying events accordingly. WMRA board member and US team manager Nancy Hobbs chose The 2015 Rut 50 km in Big Sky, Montana, for the qualifying event for the 2016 USMRT due to the difficulty level and course profile of the coming Gorski Marathon 42 km. Matt Shryock, Ted Farley, and myself all qualified for the team as the top-level Americans at the Rut. With an average of 387 feet of gain per mile, the Gorski Marathon was by far the steepest and shortest mountain running event of my career. The course ascended two peaks on either side of the Baca river valley: Cez Suho (5774 feet; 1760m) and Porezen (5216 feet; 1590m). The majority of the course was below tree-line on runnable two-track dirt roads, but the two summits offered incredible reaching vistas displaying the endless green ridge lines of Slovenia. Much of the muddy, rocky, and root-covered terrain had been soaked for days of heavy rain that graciously let up the morning of the race. Despite the steepness of the terrain and difficulty of footing, very little of the course could be considered technical or dangerous. GM40 began in the small village of Podbrdo. All nineteen participating nations greeted the town with a short 400m road jog to the starting time plate. Almost immediately, the course ascended nearly 4000 feet (1200m) in 9 miles (15 km) on dirt roads, catapulted runners down a steep single track into the rolling farm roads and pavement of the valley, then climbed back up a second 4000-foot climb in less than 4 miles (6 km), before the screaming 3500-foot descent (1060m) back to Podbrdo. During the first climb, Andy Wacker took the race lead despite just coming off a week-long flu. His strength declined quickly with his depleted energy reserves, however, and he was forced to retire from the race after the first climb and descent at mile 17 (28km). Mendoza then took the lead for the Americans, eventually finishing in 11th place in 3:59:58 under the previous course record time. Shryock was the surprise of the day taking 15th place just 1.5 minutes after Mario with an effective pacing strategy and his strong climbing and descending skills. Maskimow and Farley both had difficulties with injuries but persevered to take the US mens team to 5th position behind Italy, Great Britain, Germany, and Slovenia. Megan Kimmel led the US women from the start, running in a podium position for most of the race. Late in the game, she described being passed by several bold runners desperately taking some risky moves on the final descent but she still took a solid 8th position in a time of 4:40:28. Anita Ortiz demonstrated her clear mastery over the sport with a strong race from start to finish, taking second for US women and 13th overall. Cam Mayfield and Maria Dalzot ran together for most of the first ascent, but early in the race Dalzot suffered a wrenching ankle injury that made the tricky footwork nearly impossible on the descent. She was forced to pull out after the first mountain. Cam pulled on her talent and speed to run a swift race despite the course being one of the greatest challenges she has encountered in running to date. On the final descent, I pulled past Cam to run into the third and final scoring position for the US team. Among the women, the US took fourth behind Italy, Slovenia, and Great Britain. Although the US team suffered numerous setbacks, we pushed through together to take a respectable position at the 2016 World Long Distance Mountain Running Championships. The 2017 World Championship race will be announced by WMRA soon along with the US qualifying races. Follow WMRA, USATF, and USMRT on Twitter for more details. Pingback: Hvala! | Fit. Fearless. Female.